Sometimes, it really is only a little thing that can make a big difference. A genuine smile may brighten someone’s day. A kind word or a sincere expression of appreciation can help somebody keep on going through tough times. “Loving-kindness” was what the Tibetan Buddhist crazy wisdom master Chogyam Trungpa Rimpoche used to call it, and for him and his students it was a most pertinent practice. It helps alleviate the suffering in the world, the old masters all say. And, yeah: It’s a cliché. But that’s the thing about clichés…often they are just old truths that we need to keep telling each other as reminders. It’s often really, really little, this loving-kindness thing. It’s pretty much ordinary and every-day. Still, loving-kindness is the best way us humans have for connecting with each other. The original story by Elizabeth Silance Ballard was first published in a 1974 issue of Home Life magazine as “Three Letters from Teddy.” Over the next three decades it spread, even making an appearance in one of the CHICKEN SOUP FOR THE SOUL books. It is a good story. Here’s another video produced by the Fellowship Bible Church in Little Rock, Arkansas that was published on YouTube by Sarheed Jewels in 2011. It asks: What if you could see other people’s problems? How would that affect you? One of the loveliest online sites about loving-kindness in action is the one put up by the Random Acts of Kindness Foundation (RAK), a group of educators and community leaders led by Gary Dixon who are all dedicated to the proposition that us humans are meant to go around spreading warm fuzzies. Their mission is to encourage you to go forth and be kind. The RAKtivists believe that kindness is teachable and contagious. They can point to a lot of scientific evidence that seems to validate the fact that doing kind things is actually very good for your own health. Kindness produces oxytocin, the “love hormone.” Oxytocin, in turn causes the release of a chemical called nitric oxide which dilates the blood vessels. This aids in lowering blood pressure and helps protect the heart increasing overall heart-health. Harvard Business School did a survey of happiness in 136 countries in 2010 that found that people who were generous financially were happiest overall. People who volunteer tend to experience fewer ache and pains. One study showed that people 55 and older who volunteered for two or more organizations were at 44 percent more likely to live longer. 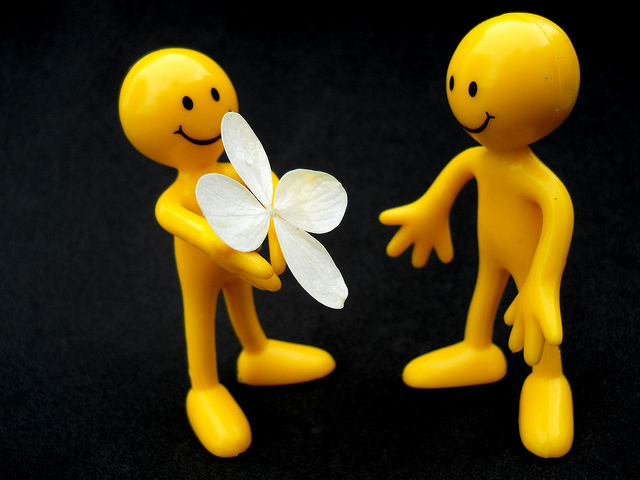 Other studies have shown that engaging in acts of kindness produces endorphins – the brain’s natural painkiller. There’s a thing called the “helper’s high,” according to research from Emory University, that is a consequence of the fact that often when you’re kind to someone else your brain’s pleasure and reward centers light up. Maybe that’s because acts of kindness apparently stimulate the feel-good anti-depressant serotonin, which helps to heal wounds, calm you and make you happy. So…here’s one other benefit to the whole kindness thing: When you’re kind to somebody else, it just naturally bounces back on you. And isn’t that a very good thing? ‘Cept for some god-mad fool or three. Those were all things I promised me. Thanks for stopping by. I’d appreciate it if you’d drop a comment or note below and tell me your thoughts.